The increased complexity and extent of the global aviation network can accelerate the spread of communicable diseases of public health concern. Recently, air travel has been a factor in the spread of Ebola, Middle East respiratory syndrome (MERS), and Zika. 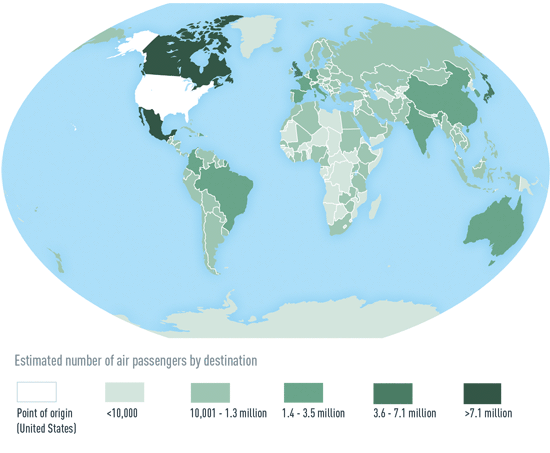 International airlines connect approximately 40,000 global cities and carry about 3 billion total passengers per year. Growth in air travel over time reflects a volume growth on established routes and a nodal growth where more airports and cities globally are connected. Understanding the overall trends of global air travel can inform the response to issues of public health concern and allow for targeted mitigating measures to limit the spread of communicable diseases. About 100 million passengers flew from the United States to overseas destinations during 2015. Map 1-01 shows the spatial distribution of these passengers by destination country. Five destination countries (Mexico, Canada, United Kingdom, Japan, and China) account for 40% of all outbound international air travel from the United States. Table 1-01 below shows the volume and proportion of air travelers from the United States into each of the top 10 destination countries in 2015. Seasonal trends in travel are discernible from year to year; overall outbound travel peaks in the summer and has its nadir in February. Seasonal trends also vary by destination. For example, although outbound travel volume to Europe peaks in June, the volume of passengers to the Caribbean, Latin America, and sub-Saharan Africa peaks during December. During 2014, approximately 83% of the US residents who traveled overseas did so for vacation or to visit family and friends and 17% for business. US residents traveling abroad made reservations on average 68 days before departure. This period should allow travelers time to schedule a pretravel consultation to get recommended vaccinations and learn about health precautions. 1 Diio Market Intelligence, Fares and Market Sizes, Global (at www.diio.net). According to the International Air Transport Association (IATA), the combined global volume of inbound and outbound air travel is projected to more than double and reach 7 billion total passengers per year by 2034. China and the United States are anticipated to lead the growth volume. The fastest-growing routes include those to Africa, Asia, and South America; travel to countries such as the Central African Republic, Ethiopia, Malawi, Rwanda, Sierra Leone, Tanzania, and Uganda, considered to be at high risk for travel-related diseases, is expected to double in volume over the next decade. This growth could lead to increased exposures to communicable diseases. Public health planners, responders, and clinicians will need to take these projections into account when developing strategies to prevent the spread of communicable diseases of public health concern through international travel. Chen LH, Wilson ME. The role of the traveler in emerging infections and magnitude of travel. Med Clin North Am. 2008 Nov;92(6):1409–32. Hui DS, Perlman S, Zumla A. Spread of MERS to South Korea and China. Lancet Respir Me. 2015 Jun 4;3(7):509–10. International Air Transport Association. 100 Years of Commercial Flight | Small World, Big Future. [cited 2016 Mar. 21]; Available from: http://flying100years.com/. International Air Transport Association. IATA Air Passenger Forecast Shows Dip in Long-Term Demand. The International Air Transport Association (IATA), 2015 [updated Nov. 2015; cited 2016 Apr. 5]; Available from: http://www.iata.org/pressroom/pr/Pages/2015-11-26-01.aspx. International Air Transport Association. FMg DM. Global passengers volume based on ticket settlement data from ARC and IATA. 2015 [cited 2016 Apr. 05]. Musa EO, Adedire E, Olayinka A, Adeoye O, Adewuyi P, Waziri N, et al. Epidemiological profile of the Ebola virus disease outbreak in Nigeria July–September 2014. Pan Afr Med J. 2014;21(1):331. Musso D. Zika Virus Transmission from French Polynesia to Brazil (Letter). Emerg Infect Dis. 2015 Oct;21(10). US Department of Commerce International Trade Administration. Profile of U.S. Resident Travelers Visiting Overseas Destinations: 2014 Outbound. 2014 [cited 2016 Apr. 05]; Available from: http://travel.trade.gov/outreachpages/download_data_table/2014_Outbound_Profile.pdf.